Note 1: Like Neo Geo games? Check out my reviews of Sengoku 3, Football Frenzy, Dunk Dream, Neo Bomberman, Super Dodge Ball, and Shock Troopers: 2nd Squad! Flying Power Disc was released in Japan. 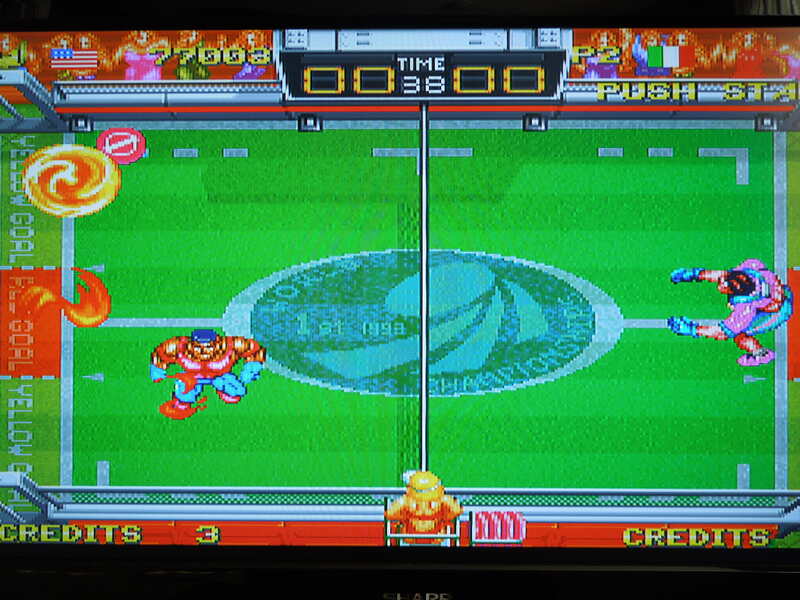 In the U.S., the game was called Windjammers. Quick History: Flying Power Disc was released for the Neo Geo AES home console and Neo Geo arcade cabinent (called MVS) in Japan in 1994. 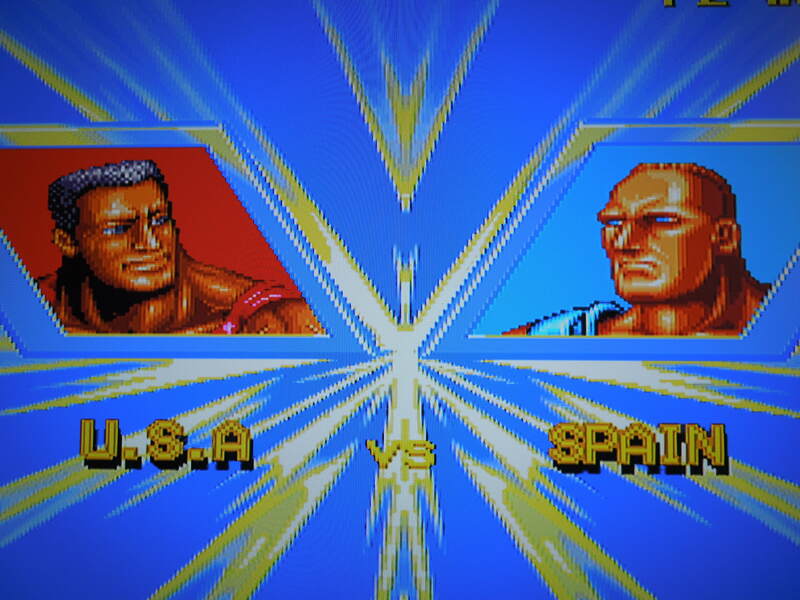 In the United States, the game is called Windjammers, but the two games are basically the same. 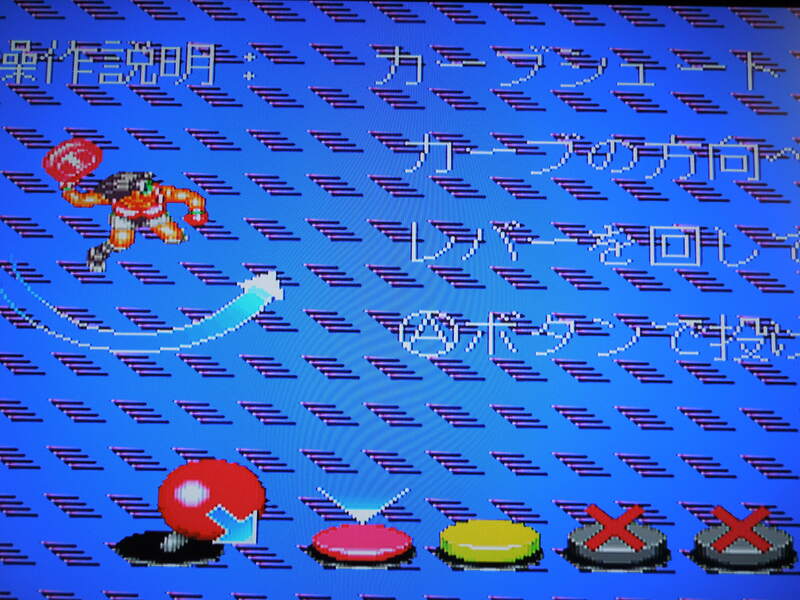 Interestingly, if you play a Windjammers cartridge on a Japanese Neo Geo AES, it will have the Japanese title, Flying Power Disc. 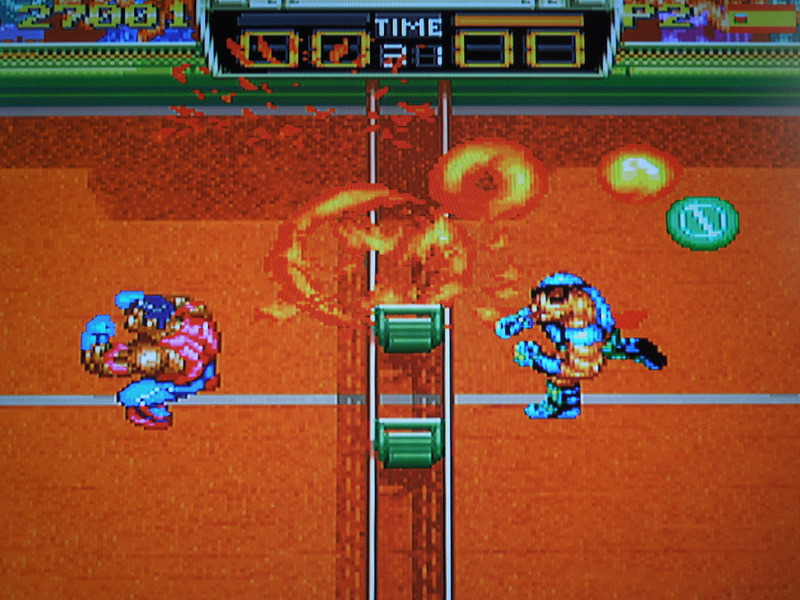 Likewise, if you play a Flying Power Disc cartridge on a U.S. Neo Geo AES, it will have the U.S. title, Windjammers. Basically, it’s the console – not the cartridge – that determines what screen you see. Many Neo Geo games had different titles depending on where they were released, as well as other small in-game differences. Japanese consoles played cartridges assuming they were for a Japanese audience, and U.S. consoles played cartridges assuming they were for an American audience, regardless of where the cartridges came from. This review is specifically for the Japanese version, Flying Power Disc. What is Flying Power Disc? Simply put, Flying Power Disc is a one-on-one game where you try to throw a disc (frisbee) into your opponents goal. The game has been compared to Pong, and also Air Hockey. 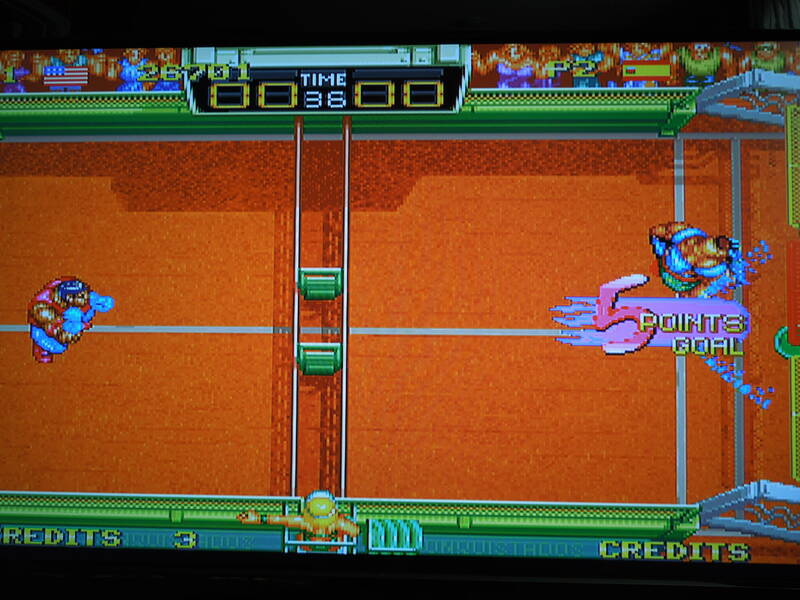 The game is played on a court similiar to a tennis court, but the size and layout of the court varies. You occupy one half of the court, and your opponent occupies the other. You cannot cross to his or her half, and vice versa. You play a ‘Set’ of matches, and it’s the best of 3. Each match is 45 seconds long, and you play to 15 points. If the clock runs out before either player has reached 15, then the player with the most points wins. If the game is tied after the first match, then the winner of the next match wins the game. If you win the first game, your opponent wins the second, and you tie the third, then you’ll play Sudden Death. If the clock runs out without a winner in Sudden Death, you both lose. You play ‘best of 3’ matches vs each opponent. Scoring: You must simultaneously attack your opponent’s goals and defend your own goals. Typically, each side of the court will have two larger 3 point goals and one smaller 5 point goal. Throwing your disc into your opponent’s goal will net you the appropriate number of points. Also, if you throw the disc into the air and it hits the ground on your opponent’s side before he can catch it, you’ll get 2 points. Control: Flying Power Disc only uses 2 of the Neo Geo AES’ buttons: A and B. A throws the disc, and you can angle or curve the disc by rotating or pointing the joystick in a certain direction while pressing A. The disc will bounce off walls and sometimes small ‘bumpers’ in the center of the court (only on certain courts). B lobs the disc high into the air. The purpose of the lob is to try to throw the disc to an area of your opponent’s side where he or she won’t be able to get to it – remember, if it hits the floor before they catch it, you’ll get two points. You can move around your side of the court as long as you don’t have the disc, but when you possess it, you’ll be stationary. The faster you press A to throw the disc back once you catch it, the faster your throw will be. You can’t hold the disc for more than 1-2 seconds before you’ll automatically throw it back. Sometimes, the disc will pop up into the air, and come down to you slowly. During this time, hold A or B to ‘power up’ your player for a Super Shot, which is hard to catch and sometimes changes directions quickly. Your character will also slide in any direction for amazing saves if you press the joystick towards the area where the disc is headed. Using Super Shots increases your chances of scoring. Sound and Music: Really great. Each character has their own voice clips, all of which are supposed to sound like their character’s country of origin. The American says, “Right on!” when he wins. The German issues an intimidating “Woooo!” when you select him. They’re quite amusing. The sound effects for the disc – flying all over the court, smashing off the arena walls, and crashing into the goals – are fantastic. There are also different songs for each court, all of which are great. One even has some type of rap song playing! 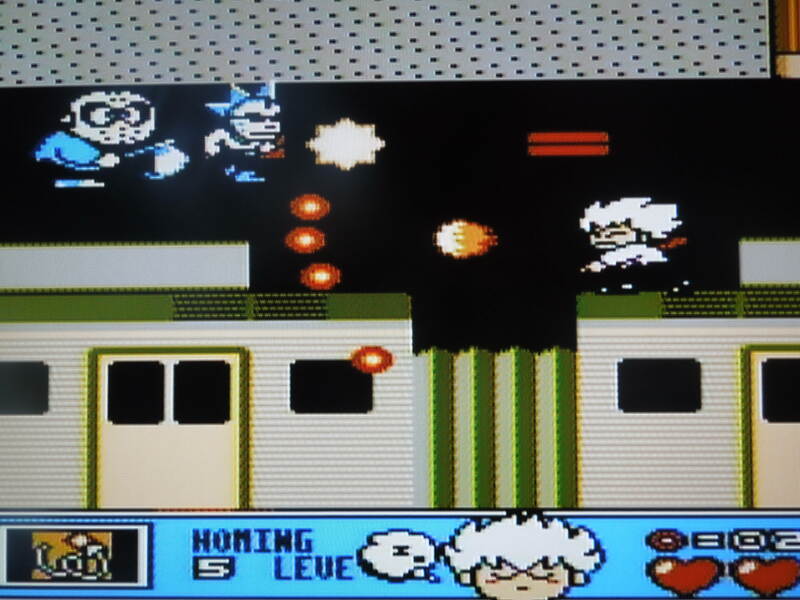 Characters: The game is relatively short, with only 6 selectable characters. You’ll face off against all 6 in an International Flying Power Disc Tournament (you’ll play a mirror match versus yourself to bring the total to 6). There are 6 countries represented: U.S., Japan, United Kingdom, Germany, Spain, and Italy. Each character has their own strengths and weaknesses. Some are quicker but throw the disc more slowly, and some throw the disc quite fast but move slowly. All characters have different Super Shots. Courts: There are 6 different courts avaliable to play on. Some are smaller, some are larger. The size of the opponent’s 3 and 5 point goals vary based on the court, as do the ‘bumpers’ that appear in the middle of some of the courts. In one-player mode, you cannot select the court you play your opponent on – it will be selected for you. In 2 player VS, you do have the option to choose your court. Your opponent typically has larger 3 point goals, and a smaller 5 point goal. You get some basic info about the characters on the ‘Character Select’ screen, or you can see a more detailed account if you don’t press Start to begin the game. Options: You can set the difficulty from 4 choices: Easy, Normal, Hard, and MVS (arcade difficulty – between Normal and Hard). Beating the game on anything above Easy is tough. Oh, and you have a pre-set limit of 4 credits per game, which you cannot add to or substract from (like many NEO GEO AES games). So if you lose 4 times, it’s Game Over and back to the Start screen. However, if you have a Neo Geo Memory Card, you can save your game and re-start from where you left off. Language Barrier? No. The only Japanese you’ll see is when the controls are being explained, after you’ve selected your character. However, the controls take all of 1 game to figure out, and you can always just watch the image of the control stick, buttons, and character during this demo to see what buttons do what. Everything else is in English. So, where can I find this game? 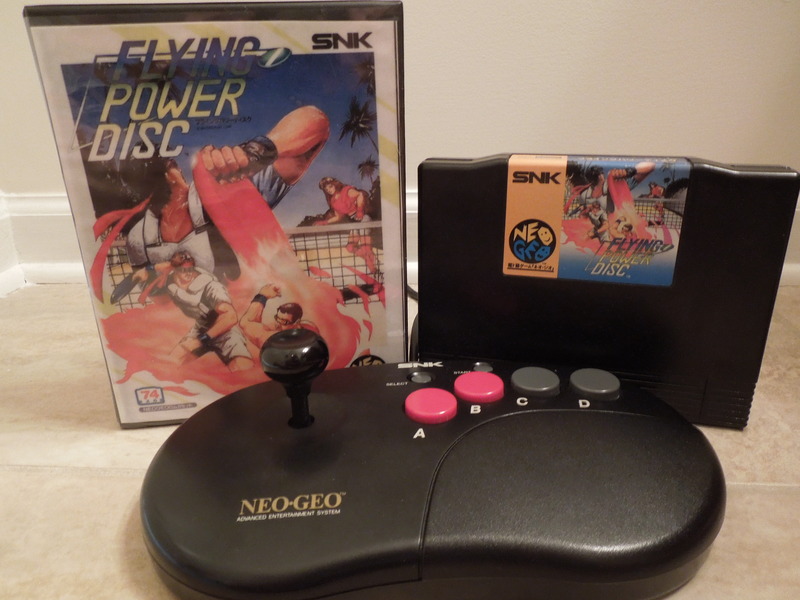 You can look on ebay for the Neo Geo AES cartridge of Flying Power Disc or Windjammers. Remember, depending on what region your console is from (U.S. or Japan) affects which title screen you’ll see. 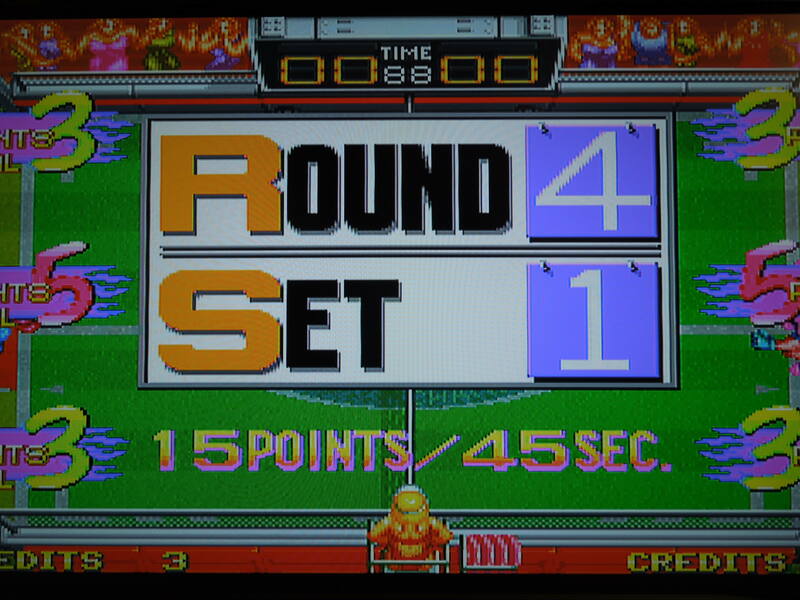 Oh, also – if you play the game as Windjammers on a U.S. console, you’ll have 30 second matches to 12 points instead of 45 second matches to 15 points. I prefer the Flying Power Disc version for this reason. Both Windjammers and Flying Power Disc were released for the Neo Geo CDZ also. I believe the CDZ games even extended the time limit on matches to 99 seconds. I don’t believe the game has been made avaliable for download on any modern-gaming consoles in the U.S. You can always play it on an emulator on your computer. Despite being released in Japan, everything in the game is in English, except for the ‘Controls Explanation’ demo. Conclusion: This is a wonderfully addictive, super-fast-moving game. There’s nothing else quite like it. Frankly, it’s hard for me to imagine a gamer picking it up and not enjoying himself or herself. It’s simple, yet you can practice and learn to do the different Super Shots and angle or curve your throws to become quite proficient at the game, adding some complexity. 2-Player VS is really fun, of course. It’s the kind of 2-player game that hearkens back to the old video game saying, “Just one more game.” Short, simple, and really fun. 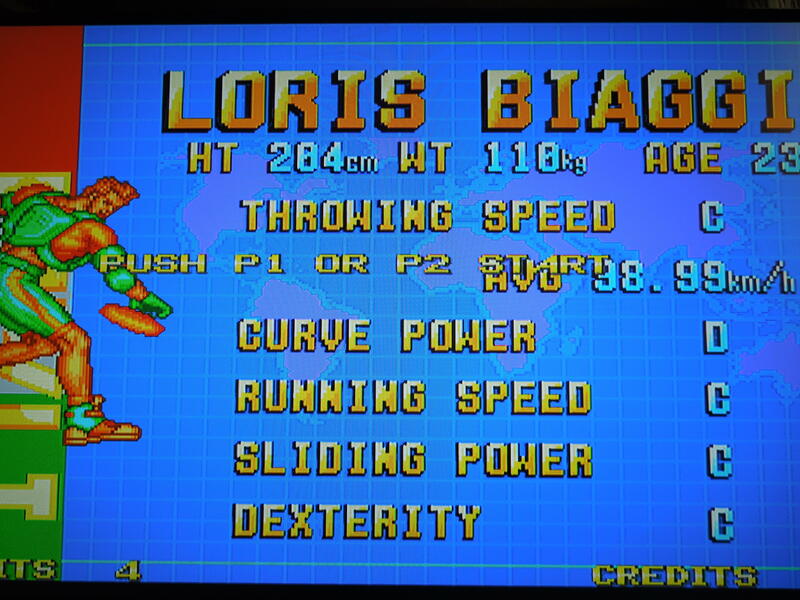 This entry was posted in Neo Geo - Flying Power Disc and tagged Flying Power Disc Review (Neo Geo AES). Bookmark the permalink.